There's no more 25 cent fee for Muni's Limited Use Tickets! Fresh from the Examiner, the fee is now waived for you lazy folks who doesn't want to buy a plastic Clipper card. UPDATE #2: Now official by the SFMTA/Muni. Made of paper, not durable. Valid for only 90 days. Can store up to two Muni rides. Can purchase ticket to be valid for adults, and youth/senior/disabled. Automatic transfers for Muni included. Not valid on all other participating transit agencies accepting Clipper (Golden Gate, BART, Caltrain, & AC Transit). Once lost, no replacement given. Made of plastic, durable (to a certain limit). No fee to obtain until June 2011. Can store up to $300 in e-cash, various e-passes, and e-ticket books. Cards issued at vending machines and in-person retailers encoded for adults. Youth and seniors must apply, and disabled must go through RTC registration. Automatic transfers, including inter-agency transfers honored. Valid on all other participating transit agencies accepting Clipper (Golden Gate, BART, Caltrain, & AC Transit). If card is lost and registered with Clipper, replacement and restoration of funds available. Any idea why Clipper cards must be purchased rather than rented/loaned like similar products? Oyster and Octopus cards have fully refundable deposits. Clipper then charges an additional $5 to refund any remaining balance on the card. No idea. At least they are free. How is it that Clipper can get away with charging a $5 administration fee for refunds? That's just plain ridiculous! 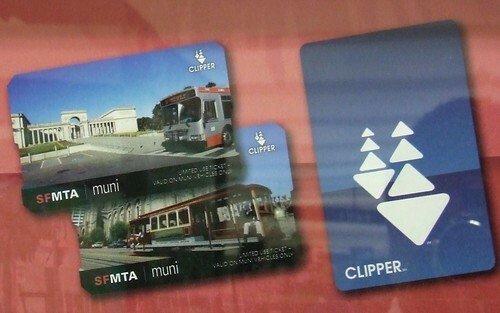 Will Muni Paper Pass Vendors Convert to Clipper?